The remainder of this post is for archival purposes and is out-dated. 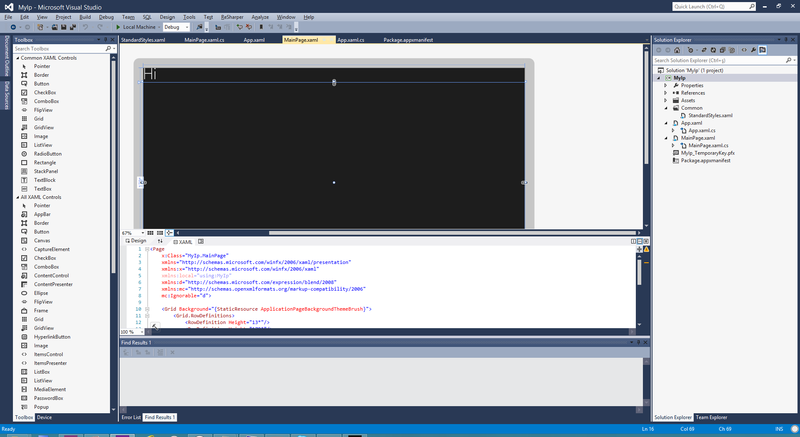 So, Visual Studio 2012 is nice but I ran into some serious usability issues. I like the dark theme, but it was too dark. Something between light and dark would have been perfect. I turn down my monitor’s contrast to the lowest setting. I turn down my Nvidia driver contrast down to the lowest setting. I spend a lot of time on the computer so it is important to keep these settings where they are. I don’t want fiddle with these nobs back and forth just to use Visual Studio. Notice, there’s a Data value in each sub-key category. This Data value is binary-byte packed with color values and color names. I wrote a small tool that that reads Data for each category and allows you to inject your own colors. Play it safe: Please backup your registry before using this. You can backup your current theme by using the green “Backup Theme to File” button. Can I change the ALL CAPS menu? 3. Create a DWORD value named SuppressUppercaseConversion with value 1. That should suppress the upper casing on the FILE, EDIT, VIEW menu area in Visual Studio 2012. Can I change the Visual Studio 2012 Icons? I changed a color, it doesn’t work. What’s wrong? Keep trying. There’s hundreds of colors VS uses so it might take some time to find the color you’re trying to modify. Most of Visual Studio’s Shell colors are in the Environment category - take a look in there. Also, keep in mind, Visual Studio uses many colors, and sometimes colors get “brushed over” others. Click on the Reset Theme link in the main program to go back to stock colors. There’s a bug in your program. Can you fix it? Probably. I didn’t spend much time creating a bulletproof UI. I just needed something quick to hack these color values. Since it’s open-source, feel free to fork, download, fix, and push me a patch. Hope that helps, happy coding! Would it be possible to modify to work with Visual Studio Express 2012 for Web? Firstly, Brian thanks I think with a bit of trial an error I can make life a little more bearable. For others like myself who are using the web express version then to get Brian’s tool to work download the source code and change the RegPath variable in the ThemeReader class to Software\Microsoft\VWDExpress\11.0_Config\Themes i.e. replace VisualStudio with VWDExpress. Recompile and you should be able to play with you themes. Brian, thanks for sharing your ‘solution’ to this horrific mistake of a GUI. From what I can tell, your program only modifies the two themes provided by MS. Is that correct? That’s definitely a start but what about the icons, are they still in black and white? Is there a way to get color icons? Yes, it only modifies Light and Dark themes. I did see some colors for Icon background and Glyphs. You might want to try fiddling with those settings in the Environment category. 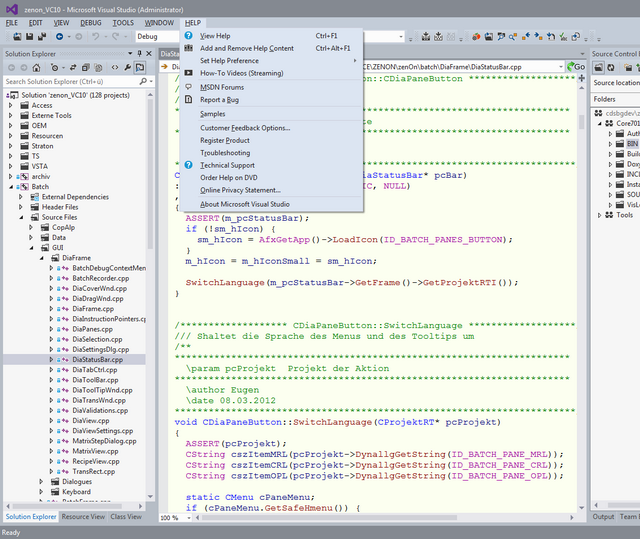 There is a plugin for Visual Studio 2010, called “Visual Studio Color Theme Editor”, I’m sure you know it. I notice that with this editor you can export the setting in xml, and the color names are exactly the same as those of Visual Studio 2012. Excuse for my english, I hope you understand what I mean! I see what you’re saying, but simply importing a VS2010 theme isn’t that easy. 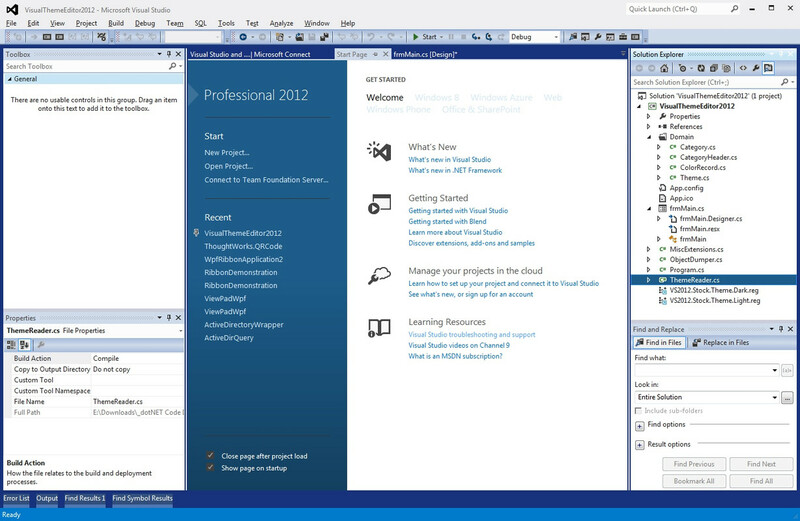 There are many more brush strokes in VS2012. So, ToolwindowButtonInteractiveBorder might be listed, but it also has many additional accompanying “partner” brush strokes that are new to VS2012. The end result may look like a theme that is half VS2010 and half VS2012. For example, ToolWindowContentTabGradientBegin and ToolWindowContentTabGradientEnd would be missing in an exported VS2010 theme. So I changed the color for Environment -> Highlight thinking this would change the “Highlight” color in the solution explorer…nope. Doesn’t work. Is there a different variable for this? I just want to change the background color of the solution explorer to white. @Brian: Thank you a lot! Nice job, Brian, thank you ! I installed your VS2010 theme reg file. It worked immediately. THANKS!!!! you saved my eyes (and my mood). I like this theme. It is years ahead of the standard VS2012 themes. Thank you so much - my systolic decreased a full five points after installing Cihan’s 2010 theme. Thank you Cihan! Cihan, great theme! Thank you! What key to use to change main menu (File, Edit, View, etc.) background color? I’ve tried what I knew, but I couldn’t any that would work. Oh why tf you can’t put these files on your server but giving links where is register? I opened that page with hope I download it from here.